The federal government on Wednesday released its long-awaited plan for cleaning up cancer-causing soil in the Lower Willamette River, settling on a "hybrid" proposal that includes doing nothing for the vast majority of the 10-mile-long contamination zone. The U.S. Environmental Protection Agency plans to dredge the river bottom and trap contaminated sediments under a confining layer in just a few hundred acres of the 2,200-acre Portland Harbor Superfund Site. In other areas, the agency hopes to let Mother Nature do the rehab work, sometimes with a kick-start from cleanup crews. The $746 million plan plucks strategies from several potential cleanup ideas presented before a federal review board late last year. But for some 85 percent of the Superfund zone, the agency would let nature take its course without any help at all. That detail is likely to irk tribal representatives, community activists and environmental advocates, all of whom have pushed for more widespread active cleanup. Representatives for the businesses and government entities that could share the cleanup bill, however, have pushed for less. "We've weighted all the different tradeoffs: Certainty, cost, time, impact to community, how much of the contamination is addressed through more aggressive actions or not," said Cami Grandinetti, a manager with the federal agency. "We think we've found the right balance, but we want to hear from people." You've got two months to weigh in with thoughts on the plan, known as Alternative I. The environmental agency will accept public comments through Aug. 8, in hopes of releasing a final plan by year's end. Cleansing the Willamette from a legacy of industrial pollution won't be cheap or quick. Industry left the river's sediments rife with unsafe levels of more than 40 contaminants, including cancer-causing heavy metals, dioxins and PCBs. The federal plan for the 10-mile stretch from the Broadway Bridge to the Columbia Slough is expected to take seven years of work, plus another couple of decades for natural processes to finish the job. Cleanup costs will be split among some or all of more than 150 entities that could share responsibility for dirtying the river decades ago. Those parties include businesses, the Port of Portland and Portland's city government. All told, the feds plan to take no action along nearly 1,900 acres of the superfund site. The tactic, known as "monitored natural recovery," relies upon microorganisms, soil and flushing river flows to destroy, disperse or bury toxic chemicals. Federal officials estimate this process will take 23 years. On the remaining 291 acres -- the superfund's most polluted areas -- they plan to employ a mix of cleanup tactics. One-hundred and sixty-seven acres would be dredged to remove soil from the river bottom. 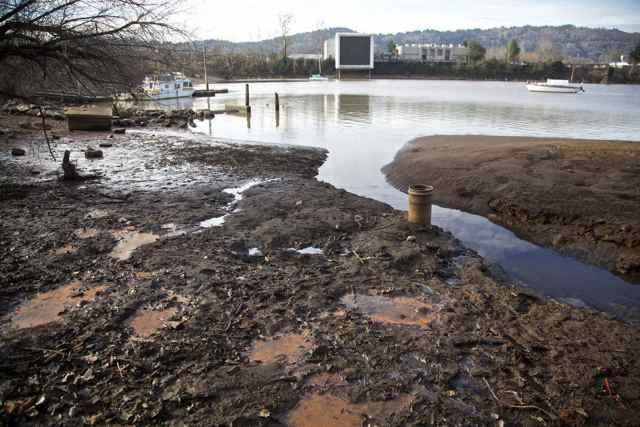 Some of that soil would be shipped to a landfill, while some would be stored in a containment structure in the river. Federal officials have hinted, however, that the final plan could call for sending all dredged waste to landfill. Sixty-four acres, including 10,000 feet of shoreline, would be capped with a confining layer of plastic or other material. On 60 acres, the plan calls for "enhanced monitored natural recovery," or leaving contaminated soils in the river while strategically placing sand to speed up natural healing processes. James Woolford, a federal superfund manager in the environmental agency's Washington, D.C., office, called the plan "balanced approach" to cleanup. "It also provides, I think, the most cost-effective approach," he said. The plan's pricetag is far lower than the $2 billion maximum cost estimate regulators have previously cited. The Portland Harbor has served for more than a century as Portland's industrial core, holding past businesses including a gas plant and a manufacturer of the toxic pesticide DDT. Many of them dumped their waste directly into the Willamette, leaving behind pollution that makes it unsafe to eat resident fish. The Environmental Protection Agency has spent 16 years working on a plan to reverse the damage, a process riddled with delays. The agency twice pushed back its plan release date after the task of creating a website to host the plan and its supporting documents proved more cumbersome than expected. Community groups, meanwhile, are fuming over the timeline afforded for public input. They say two months isn't long enough for Portlanders to read, analyze and respond to a document so dense and technical, it took 16 years to produce. "Accelerating the process at the very moment that the public finally has the opportunity to weigh-in is not equitable, credible, or acceptable," Audubon Society of Portland conservation director Bob Sallinger wrote Monday in an email to the EPA's regional administrator, Dennis McLerran. Agency leaders say they've already doubled the public comment period from the 30-day minimum required by law. They say further delay could jeopardize their goal of finalizing a cleanup plan before President Barack Obama leaves office. The plan is likely to face substantial criticism from all sides. Tribes with treaty fishing rights, environmentalists and community groups all have pushed for far more aggressive cleanup and far less of the do nothing option, known as "monitored natural recovery." Many are lobbying for at least 1,000 acres of dredging while urging the agency to commit to a cleanup that will make the river's catfish, bass and carp safe to eat. Even before Wednesday's draft plan became public, environmental advocates who had caught wind of its details were raising their concerns. Travis Williams, executive director of Willamette Riverkeeper, called it "nowhere close to where this cleanup should be." "You've had the Willamette River subsidizing the cost of doing business as usual," Williams said. "It's time to pay the river back." Sallinger called the plan "a capitulation to industrial polluters." Rose Longoria, a superfund coordinator with the Yakama Nation, called that detail a violation of the tribe's treaty fishing rights. She said the Yakama Nation Tribal Council had met with federal officials to urge them toward a more aggressive cleanup effort. "The consultation did not seem to affect their plan," Longoria said. "If anything, the plan went in the wrong direction." EPA officials expect their plan to reduce contaminant levels enough to allow most people to safely eat about 20 fish each year from the river – but not everyone. Pregnant women and mothers with nursing children are particularly at-risk. Representatives for the entities expecting to split the cleanup bill have pushed for less dredging and capping. They argue the river is already showing signs of recovery, and that additional dredging and capping would saddle companies and taxpayers with an onerous, unnecessary cost and time burden. Last month, the Lower Willamette Group, which represents 14 of the potentially responsible parties, submitted a massive records request for documents its spokeswoman said were needed to critique the federal agency's proposed plan. The Environmental Protection Agency is still processing that request. Reached by phone Wednesday, representatives from the Lower Willamette Group and the Port of Portland said they are still reviewing the plan and have yet to form an opinion on its contents. "Our hope is that the Proposed Plan and subsequent Record of Decision will lead to implementation of a health protective, timely, and cost-efficient cleanup of the Portland Harbor," a release from the Lower Willamette Group stated. Environmental advocates hope recent outcry over environmental hazards in Oregon will fuel a strong public response to the EPA's superfund plan. Since this spring, Oregonians have endured news of industrial air pollution hot spots, lead contamination in public schools and a fiery oil train derailment in the Columbia River Gorge. The federal agency has scheduled four public meetings to go over the plan and gather comments. Community groups are planning additional outreach.